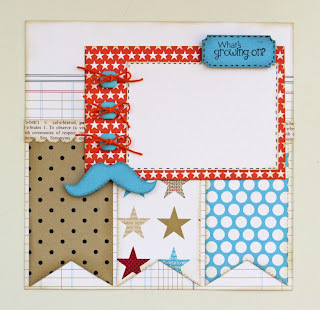 Liz's Paper Loft: My Creative Time ~ May Stamp Release: "What's Growing On?" & "Tag Dies"
My Creative Time ~ May Stamp Release: "What's Growing On?" & "Tag Dies"
I hope you had a wonderful Mother's Day (even if it's to a fur baby)! This is an exciting day for me, for two reasons! The first is that it's May Stamp Release: "What's Growing On?" & "Tag Dies" at My Creative Time and the second is today Liz's Paper Loft Boutique officially opens! So let me get to my project first, then I'll let you know what's going on at Boutique! You are going to LOVE this month's release! If you've been to Miss Emma's blog last week then you've already seen some projects. Oh they're sooo cute! 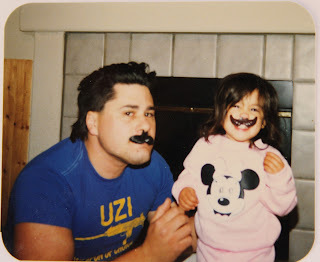 I knew that I was going to make a layout when I first saw the mustache dies, because of a picture I had taken about 22 years ago! I hope all this wasn't too confusing!!! I'll be back later today with a quick litte hop! Very cute layout!! I love how you used the tag die!! Congrats on the store!! this is such a great LO Liz!!! Love the use of Emma's new dies and stamps!And such an adorable picture!!! Congrats on your new store!! All around exciting news over here! I LOVE this layout, Liz! The colors are awesome, and the tags make such a nice background! The picture is absolutely adorable! Congrats on your GRAND OPENING today!!! Very fun. I love the layout what a great memory and the photo is so cute. That is perfect for this die set. Great job. Congrats on your boutique -- off to check it out. Adorable LO. Congrats on the Grand Opening of your new Boutique. Wishing You all the Best. Hope you had a Great Mother's Day. Enjoy your week. Liz ~ Oh how ADORABLE is this picture of your daughter and hubby! GREAT memories ~ TU for sharing! The layout is beyond AMAZING! The papers & patterns, the layout and of course the embellies! FABULOUS as always! Great layout for this adorable photo! super cute pic and awesome layout i love the colors you used. What a great layout.. Cute idea with the tags.. I love that... I realy love the paper... What a sweet pic of your hubby and daughter.. Your layout is really cute. Love your idea. Thanks for sharing. Love the new hemp twine, and the layout. The pic is hilarious, now I remember a pic I have that would be perfect for this set and I didn't order this one. Phooey! What a great layout! Love that help twine in the buttons! Perfect color choices! And the tags as part of your layout - genius! Great job Liz!! These are so cute! I love the bright colors and the buttons . Wish I could play with all these great toys. great looking card. Looks like fun. Your layout is perfect for the photo! Love how you used the tags and the mustache in it. I love this layout it is perfect the colors design it all just flows so good togehter!! Very cute layout and I love your family picture. OMG, your picture is adorable, well the layout is too! Oh my, this is so fun and I just love the papers and great picture! How adorable! The pic is precious! Great LO the colors look great togheter, TFS Liz and congrats on the oppening of your store, much success to you! 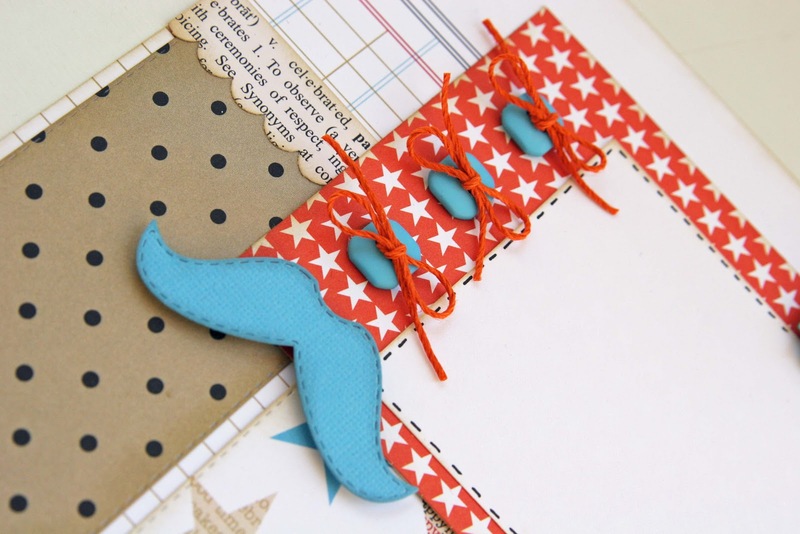 What a cute project with that mustache die. And the photos of your hubby and daughter with Mr. Potato Head mustaches are too cute! I actually saved my daughter's Mr. Potato Head family toy, and my 2 year old grand-daughter is now playing with it all over again! So fun! Adorable picture. The layout is perfect for it. Love the papers and the way you used the tags. I'll have to check put your store next. An adorable layout!! !SO in love with the color combo! How perfect! Cute layout! TFS! Cute layout! Love the picture too! So funny!